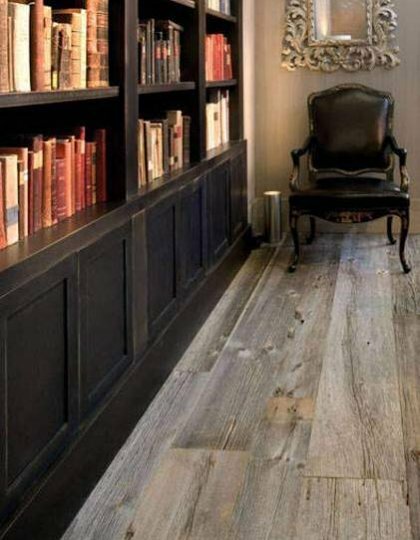 Hewn floor boards of 18-19th centuries from conifersare highly demanded among the connoisseurs of antique elements in modern architecture and interior. 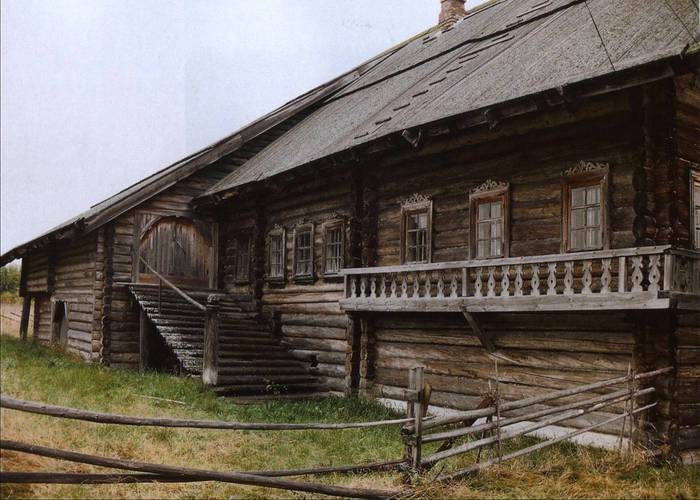 We offer hewn floor boards of Russian North (the Arkhangelsk Region, the Vologda Region) to our customers. The density of timber is high there due to severe winters and this is highly valued by our clients. Laying of floor boards delivered by us will not create any problems, because, caring about the proper build procedure, we enumerate all boards when dissemble them. Hewn floor boards offered by us are up to 500 mm wide. Here is a short trip to the history for you to know more about the product we offer to our clients. In the 17-18th centuries the boards were not sewn. The logs were cut into halves and hewn from split along the board. The board was obtained with help of axe or adze, cutting the wood along the board or aslant (not across) the layers, removing excess layer in this way. 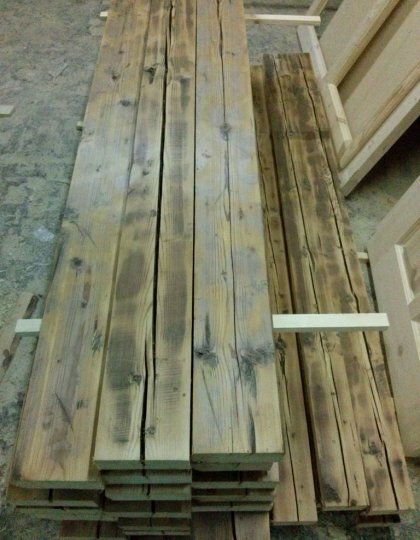 It is important that such boards are more solid than sewn boards and warp less. Besides, boards made in this way had characteristic texture pattern that reminded herring-bone pattern – these marks of axe look spectacular! 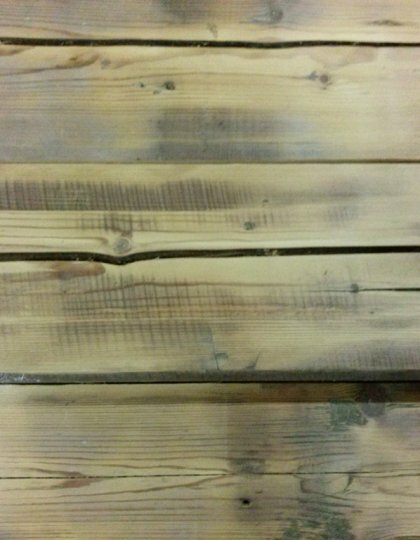 One can see wavelike marks on the longitudinal section of these boards. The marks can be compared with the washboard texture. Excellent characteristic of this board is that it is impossible to get a splinter from it. The surface is not smooth, not flat and wood chips will not split from it. 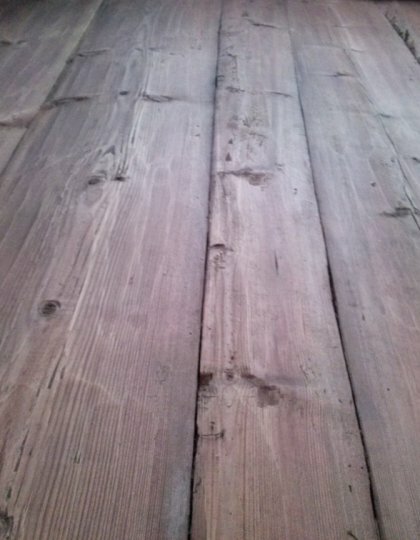 We offer antique boards that had been in use for many years. 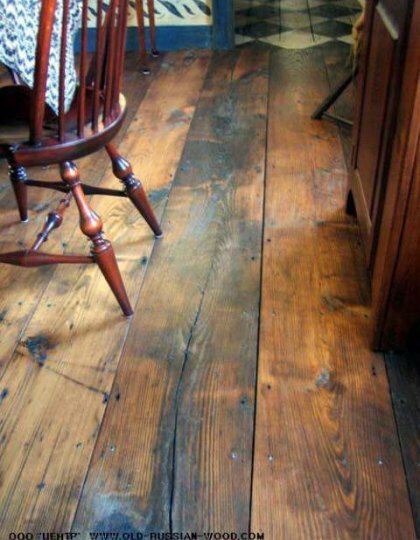 In this respect it is worthwhile mentioning that wood treated in this way was less subjected to moistening and rot. The rain water is removed faster and easier from such surface. In order to get this result, Russian carpenters hewed boards in a special way in the past, looking at the surface they processed a little aside through an axe. There was complete modernization of all carpenters’ tools in the north of Russia approximately in the middle of 19th century. The same is referred to the methods of work with this instrument therefore the boards in the constructions, which were built later, do not have the characteristic features mentioned above. 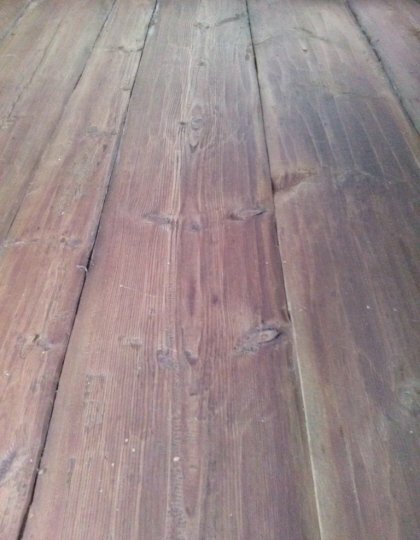 Antique boards you’ll get, are absolutely unique and integral, in spite of the fact that we remove paint, additionally polish them and cover with oil from the company Osmo. The matter is that we do not destroy the noble layer of wood because we use only liquid paint removers. 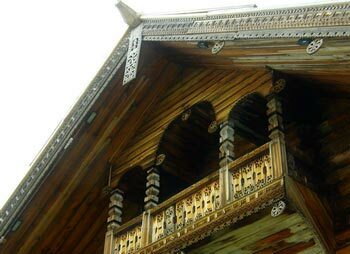 Buying hewn floor boards of Russian North, you acquire material with rich history and exclusive texture that has become mature with centuries.